It was nice to spend some rest time in Whitehorse after so long away from civilization. We toured the Yukon Brewing Company’s brewery, ate some much needed ethnic food, and restocked on food and supplies. But it was time to get back on the road. Just like in Prince George, we enter town in freezing weather and exit in warm weather. 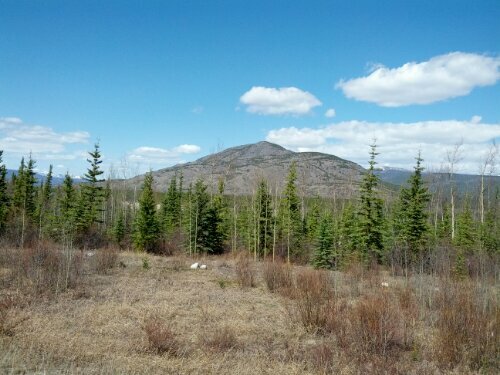 It’s in the seventies as we climb the hill out of Whitehorse and the terrain soon changes to rolling plains as we head northwest. The day is long but largely unremarkable and we stop to make camp in the forest off the side of the road at nearly nine. Our camp site is right near the top of a bluff and we have spectacular views while eating dinner. Another day back on the road and larger mountains begin appearing as we approach the town of Haines Junction. Stopping in town for lunch we refill our water bottles before getting back in the saddle. There’s a very large hill out of town and we have to take a few breaks since Donald isn’t feeling too well. I stalk a pheasant through the woods near a stream before meeting a swarm of mosquitoes and running away. We finally reach the top of the hill and enter a valley. Snow-capped mountains line our left as far as the eye can see with smaller mountains dotting the landscape to the right. It’s already getting late and we find a campsite. I think I’ve now found the pattern for my favorite type of next-to-the-road campsite. It’s where there’s a steep upwards embankment on the side of the road with a flat plateau on top. From the top of this kind of spot you often find excellent views and yet are completely invisible from the road. 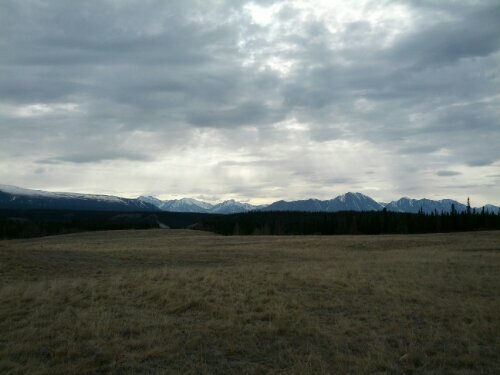 Tonight we find such a spot; it’s a grassy field with amazing views of mountains to the north and west. 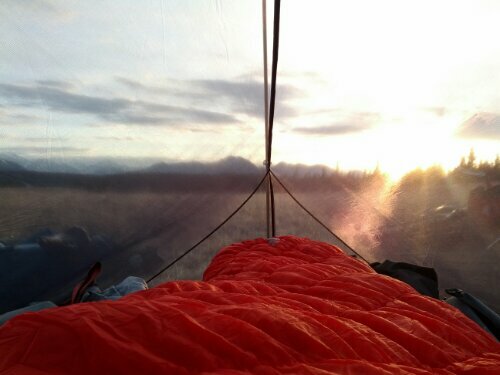 I eschew my rain fly and wake up periodically through the “night” to admire the surroundings through my tent’s mesh walls. The nearly full moon is setting over the mountains but it is too cold and I am too tired to get a photo. It gets pretty freezing overnight but warms up quickly around ten. I don’t really understand this since the sun has been up since three. Go figure. We come upon a large lake (frozen of course) and the road winds around it for miles. Then something we’ve been waiting thirty three days for finally happens – we run into another touring cyclist. Fernando started in Anchorage two weeks prior and is heading south. He had some bike troubles – cracks on his rim but seemed in good spirits. I hope he makes it to Whitehorse to get his bike looked at. 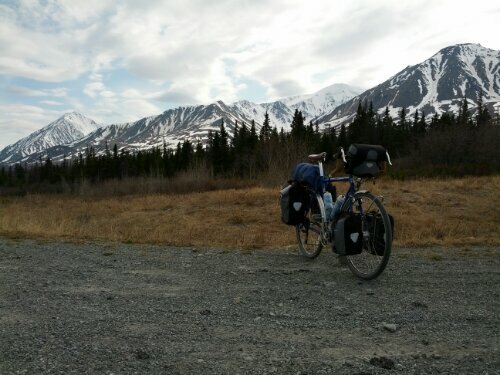 Just a few miles later we run into another touring cyclist, Tomas from Argentina is heading from Fairbanks to Florida. Looks like touring season has officially started up here. A quick lunch in the town of Destruction Bay and we’re back on the road. The next hour is probably the fastest we’ve ever done, averaging over 18mph with only a sporadic tailwind. We continue on for a couple more hours before calling it a day. Just as touring season is starting, so is mosquito season – liberal application of DEET is becoming the top priority upon reaching camp. Today’s site is less scenic and we spend half an hour looking for a good tree for our food, eventually settling on one where the branch does not reach far enough from the tree. Luckily our food is still present in the morning and we hit the road with our eyes set on the town of Beaver Creek for a much needed shower. A couple in a RV pulls up along side us and offers us soda. A quick chat later and we’re back on the road. We run into two touring cyclists heading south, first to Montana then Indiana. For the third time in two days we run into touring cyclists heading south and for the third time we hear about a couple ahead of us. For the first month of our trip we heard from a few sources that there was a solo Japanese tourist about a week ahead of us and we were the only other ones that had come through so far. But now there’s this new couple. With each southbound traveler we meet, we find out more about them. They’re two and a half hours ahead of us, or four hours, or 30 miles. They’re coming from Seattle too. They’re averaging 65 miles a day. It seems likely they passed us during our two rest days in Whitehorse; I hope we can catch up and meet them. We press on, running low on water. The road curves north and the mountains that have been with us for three days start growing more distant before disappearing entirely. There are rolling hills but the lack of mountains on either side causes an uneasy sensation – no longer are there any landmarks ahead to watch approach. The trees are more stunted now as we cross into the permafrost and it seems as if the land’s end is approaching. In truth it is only an invisible line growing near. We reach the town of Beaver Creek for our last night in Canada. The border is only twenty miles away now and tomorrow night we’ll be back in the US. Still enjoying your welcome updates. Cool to be meeting other long distance bikers as you go now. Best wishes to you and for your buddy to feel better on this grueling journey. Hi Galen! !, I´m Fernando and I finally get to Whitehorse. I needed some help of Tomas, and I had to push the bike… but we did it. I´m sure you´re going to enjoy the rest of your travel and have a nice return to home. May the wind be with you! !